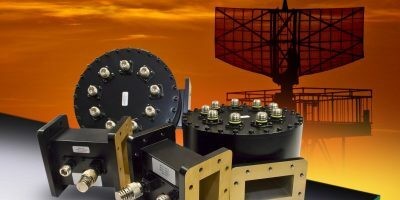 Link Microtek, the manufacturer of RF and microwave subsystems and components, has designed and produced a compact, high-power, nine-way radial combiner specifically for BAE Systems as part of its upgrade programme. The project is to upgrade customers’ S-band radar transmitters by replacing their magnetrons with multiple solid-state power amplifiers (SSPAs). Typically, the SSPAs are individual blades housed within a 19 inch cabinet. Their outputs need to be combined and then fed via waveguide to the radar’s large rotating antenna. It is this function that the special nine-way combiner performs, says Link Microtek. According to managing director, Steve Cranstone, there were several challenges involved in the design of the special combiner. “Firstly, the device had to be able to handle extremely high microwave power and be sufficiently small to fit comfortably at the back of an SSPA cabinet,” he explained. In addition to meeting these specifications, there was another crucial consideration. One of the main reasons for upgrading radar transmitters with SSPA technology is to introduce a degree of fault tolerance into the system. “Because of this fault-tolerant approach, it was vital for the combiner to be designed in such a way that it continues to perform correctly in the event of one of the SSPAs failing,” explained Cranstone. The combiner is a radial, resonant-cavity design, which is “inherently superior” at handling such non-optimum conditions and mismatches, he continued. “Even so, a lot of modelling and simulation work went into the development of the device,” he acknowledged. Another advantage of the resonant-cavity design is its compact size compared with other types of combiner. The nine-way device, with its impressive peak power capability, measures just 194mm in diameter and has a depth of only 58mm, excluding the N-type input connectors and WR284 waveguide output. In terms of microwave performance, the combiner achieves a VSWR of 1.4:1 (maximum), an insertion loss of less than 0.5dB and a peak input power rating of 2.5kW. To complement the combiner, Link Microtek also designed and produced a special 50dB S-band WR284 coupler for monitoring the microwave power at the combiner’s output. Both parts are fabricated from aluminium with a satin black finish. The first radar transmitter to be equipped with SSPAs and Link Microtek’s nine-way combiner is now in service, and BAE Systems is offering the upgrade to other customers.